Real Madrid are two points clear at the top of La Liga with 10 games remaining after overcoming Alaves to record a fourth straight league win. 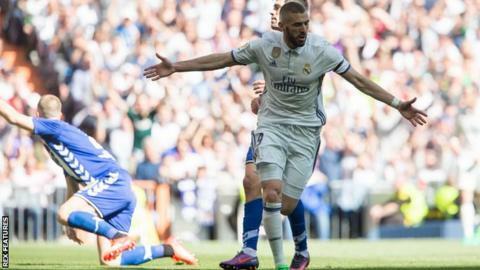 Karim Benzema put Zinedine Zidane's side on course for victory after meeting Dani Carvajal's fine cut-back. Deyverson and Edgar wasted chances to equalise for Alaves before two goals in three minutes sealed the points. Isco made it 2-0 before Nacho headed home after Gareth Bale's free-kick had rebounded off the bar into his path. Later on Sunday, nearest challengers Barcelona won 4-1 at 10-man Granada to keep the gap at two points. Despite a victory which nudged Real closer to their first league title since 2012, this was a far from vintage display by the European champions. For long periods their players looked jaded after long trips during the international break. Mid-table Alaves, promoted as champions of Spain's second-tier at the end of last season, beat Barcelona 2-1 at the Nou Camp last September and the Basque club will be frustrated they did not pick up at least a point at the Bernabeu. With Real leading 1-0, Brazilian forward Deyverson headed wide in front of a gaping net while Edgar stabbed a first-time shot wide from close blank range. It was only in the closing stages that Real put the game out of sight. Cristiano Ronaldo slipped a delicious pass into the path of Isco to make it 2-0 before Nacho's header left Alaves to reflect on a harsh scoreline. Earlier, Sevilla slipped out of the top three after being held to a goalless draw at home to struggling Sporting Gijon. Match ends, Real Madrid 3, Alavés 0. Second Half ends, Real Madrid 3, Alavés 0. Pepe (Real Madrid) wins a free kick in the defensive half. Offside, Alavés. Christian Santos tries a through ball, but Manu García is caught offside. Attempt missed. Rodrigo Ely (Alavés) header from the centre of the box is close, but misses to the right. Assisted by Óscar Romero following a set piece situation. Óscar Romero (Alavés) wins a free kick on the right wing. Goal! Real Madrid 3, Alavés 0. Nacho (Real Madrid) header from very close range to the bottom right corner following a set piece situation. Attempt saved. Gareth Bale (Real Madrid) left footed shot from outside the box is saved in the top centre of the goal. Manu García (Alavés) is shown the yellow card for a bad foul. Goal! Real Madrid 2, Alavés 0. Isco (Real Madrid) right footed shot from a difficult angle on the right to the top right corner. Assisted by Cristiano Ronaldo. Attempt saved. Mateo Kovacic (Real Madrid) right footed shot from outside the box is saved in the top centre of the goal. Assisted by Isco. Substitution, Alavés. Christian Santos replaces Víctor Camarasa. Gareth Bale (Real Madrid) hits the left post with a left footed shot from the left side of the six yard box. Assisted by Daniel Carvajal. Substitution, Real Madrid. Lucas Vázquez replaces Karim Benzema. Corner, Alavés. Conceded by Daniel Carvajal. Attempt missed. Cristiano Ronaldo (Real Madrid) left footed shot from the centre of the box misses to the left. Assisted by Karim Benzema. Danilo (Real Madrid) wins a free kick in the defensive half. Substitution, Alavés. Aleksandar Katai replaces Edgar Méndez. Attempt blocked. Cristiano Ronaldo (Real Madrid) left footed shot from the left side of the box is blocked. Assisted by Danilo. Attempt missed. Manu García (Alavés) header from the centre of the box misses to the right. Assisted by Óscar Romero following a set piece situation. Óscar Romero (Alavés) wins a free kick in the attacking half. Attempt saved. Edgar Méndez (Alavés) right footed shot from the left side of the box is saved in the top centre of the goal. Assisted by Deyverson. Substitution, Alavés. Óscar Romero replaces Ibai Gómez. Attempt missed. Cristiano Ronaldo (Real Madrid) left footed shot from a difficult angle on the left is high and wide to the left. Assisted by Karim Benzema. Attempt missed. Deyverson (Alavés) header from the centre of the box is too high. Assisted by Edgar Méndez with a cross. Attempt missed. Edgar Méndez (Alavés) right footed shot from the right side of the box is close, but misses to the left. Assisted by Zouhair Feddal with a cross. Hand ball by Edgar Méndez (Alavés). Attempt missed. Deyverson (Alavés) header from the centre of the box misses to the left. Assisted by Gaizka Toquero with a cross. Offside, Real Madrid. Karim Benzema tries a through ball, but Cristiano Ronaldo is caught offside. Delay in match Danilo (Real Madrid) because of an injury.